The resident College Bum is back tonight with a guest review of new Final Fantasy figures - take it away, Sean! It’s another visit from Sean, The College Bum. Time to go back to my roots boys and girls. No I’m not speaking about Star Wars, but about Anime figures. The first review I ever submitted to this site was for the excellent Vampire Hunter D figures by Epoch. Today I return to that area of my collection. The Final Fantasy games have made up one of the longest running series of video games ever produced, and certainly one of the most popular. Being a staunch PC and X-Box user however, I’ve never owned a single entry in the series. The last time I even played one of them was on a friend’s N64 years ago. Recently Square Enix released Final Fantasy X-2, a direct sequel to the tenth installment of the series. Despite complaints that the game completely recycled most of its environments and camera angles from FFX, there were some graphics improvements to be found, and for the first time an open-ended line of game play as opposed to the linear game story lines found throughout the series. The game scored high marks all around, especially when it came to the designs of the primary characters: Yuna, her cousin Rikku, and newcomer Paine. For those of you more interested in the ladies than the game itself, rejoice. Kotobukiya and Square Enix have produced three fabulous looking figures based on the game’s main trio. Each figure is packaged in a decent sized box with clear plastic windows on the top, front, and sides. The front has the character’s name and figure number, as well as a nice anime drawing of the figure on the right side. The back of the box has a large computer rendered shot of the character, with smaller shots of the two others near the bottom. There are also instructions on how to assemble the figure’s stand. Except for the blister holding the stand onto a piece of cardboard, the packaging is pretty collector friendly. Whenever I review a figure’s sculpt, I use many factors in judging its appearance. Are the features clear and in proportion, does the sculpt hinder the given articulation, and above all, whether or not the sculpt captures the wanted look of the figure. This last one is crucial when it comes to figures based directly off of movie or video game characters. There is a fan base out there that wants figures that look directly like the source material. That’s bad news for us William Shatner or Mark Hamill fans. But it’s good news for all Final Fantasy X-2 fans. First off, these have to be some of the best sculpts I’ve seen among six inch figures. SOTA’s Lara Croft might have these gals beat on articulation, but this trio almost looks “dead-on-balls-accurate” (it’s an industry term) when compared to the source material. Paine is my personal favorite of the bunch. I looked her up and down and couldn’t find a single flaw in her body sculpt –from her bangs to her boots. All her straps, buckles, studs, buttons, and creases are right on, and they look excellent. Her shoulder wrap is a separate piece. Here lies the only bad point: the front of it is glued to her chest. You can raise the back up to help articulation, but I would have preferred that it was removable. The head is also accurate, down to the Anime-styled hair. Many	figures have problems when it comes to Anime hair and they tend to be either dulled down or extreme, but this ‘do is dead on. Rikku is still a great looking figure, but not quite as good has the other two ladies. The ribbons on her sleeves are nicely done and don’t get in the way of her arm movement. Since she shows the most skin of the three, there isn’t much of an outfit to detail besides her bikini top and skirt. The skirt is a separate piece of sculpted rubber that looks all right, but gets in the way of leg movement. You can slide it up her torso, but it looks a little silly that way. Underneath she has a pair of bottoms that match the yellow top. Her scarf looks pretty nice, but seems to be a tad flimsy in construction –there were stress cracks at the top right out of the box. Rikku’s face suffers from the generic Anime look that has plagued numerous other figures before her, including the Vampire Hunter D Leila. While the expression seems to be appropriate, she just looks a little too doll-like. Of course the real challenge here is Rikku’s hair. I have to give the sculptors credit here, they did a really admirable job with all her wild braids and tangles, but the way they’ve attached it to her head is ripe for future disaster. Rikku’s hair is sculpted in soft rubber and consists of three layers: the bottom one consists of the braids, the middle one is the mane down her back, and the topper is a small spiky clump. All of these are attached to her skull with a single point of rubber running down the middle. It feels flimsy as hell, and I’m sure it’ll break off if she gets bumped around the head too much. That brings us to Yuna. You read it right, I gave her four and a half stars. Even though I liked the look of Paine more than Yuna, I have to tip my Kangal to whoever carved out the details of this little lady. Her main body consists of her blouse, armbands, a shoulder wrap, booty shorts, and lace-up boots. I couldn’t find a single flaw in any of these, even with the various edge details on the blouse. Her skirt and belt pouch are also well done and nicely rendered as a separate piece. I just wish they weren’t glued on as they inhibit the left leg’s movement. I was just so blown away by her overall appearance that I had to bump her up beyond the top rating just a little. Yuna’s head sculpt is pretty close. The face seems a tad narrower than the video game character’s, and it has been slightly Anglo-cized, but it has a great expression. One thing I don’t like about the sculpt is the color of plastic these women are shot in. It’s too damn pale. While the light skin works for Paine, the other two need darker hues. Rikku looks somewhat tanned in the still shots I used, and Yuna is clearly supposed to be Asian as opposed to Caucasian. The color of the plastic (in conjunction with the paint ops) really changes the characters’ ethnicity. In the end it’s about pleasing the fans, and I’ll be damn sure that most fans of the series are going to be more than happy with these excellent sculpts, and aren’t going to pick too many nits. All of these figures have really nice paint jobs with very little slop, but there are few things keeping any of them from a perfect score. Rikku has the least to paint out of the three due to her costume. The sleeves are a nice off-white, and the yellow details on her bikini have a nice wash to them. Paine may be almost completely black, but she has a ton of silver buttons and clasps to paint. Her legs are obviously shot in black plastic, so the skin tones between the boots and the shorts had to be painted to match the plastic color from the torso. It comes close but definitely looks different. The red straps are also clean as a whistle. Yuna is the most vibrant of the three. The blue-to-white wash on her skirt really leaps out at you, as does the clean black design on her chest. The silver buckles on her belt are nice and detailed with blue clasps. Even the laces on her boots are clean. My biggest criticism on these figures has to do with the paint jobs on their heads. The basics are done nicely: Rikku’s green eyes and lipstick, Paine’s red eyes, and Yuna’s blue and green eyes, eye shadow, and lips are all nicely done. However, there are no real highlights present on the faces or in the hair. 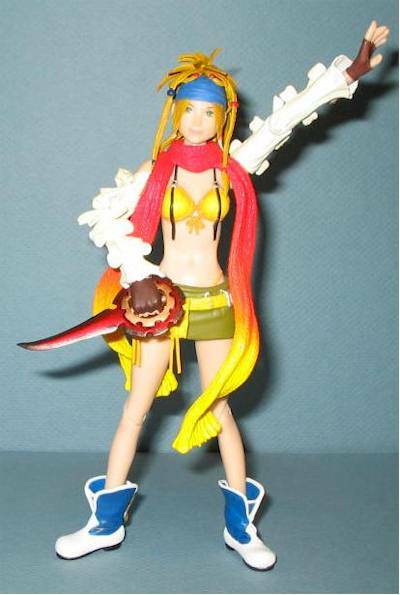 Yuna and Rikku already suffer from a pasty, Anglo sculpt. The paint ops don’t help change this very much. While Yuna still looks good, the face is not quite the same as the source material and Rikku looks a little glazed over. Paine doesn’t really suffer from this end very much. Hair-wise, Yuna and Paine are missing any highlights. Their hair is painted in solid colors only. These are not going to be figures that need to stand up to lots of play, so they don’t need to be tricked out as much as the Toy Biz Marvel Legends line. Each figure is slightly different in functional design, but there are some similarities. For example, each gal has four points of articulation on each arm, and their knees are all done the same way with a slanted swivel-joint cut. Rikku has the least amount of articulation at fifteen points: limited ball-joint head, ball-joint shoulders, bicep cuts, elbow swivels, wrist cuts, limited ball-joint hips, knee swivels, and limited ball-joint ankles. She has no waist articulation whatsoever, and that’s always a sore spot with me. Then again, I can see why it was done. The other two had their torso cut worked into their clothing to make it less obvious. Rikku’s entire midsection is bare. Her elbows are done differently from the other two. Instead of a regular swivel joint, this one’s cut on the same angle as her knee joints. It doesn’t affect the joint itself, and actually looks better hidden with her sleeves. Her natural pose is a little knock-kneed, but with a little adjustment, you can make her look all right. Paine has sixteen points: a neck cut, ball-joint shoulders, bicep cuts, elbow swivels, forearm cuts, a midsection cut, limited ball joint hips, swivel knees, and limited ball joint ankles. 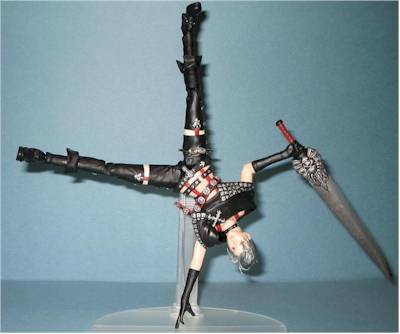 Paine has the best combination of overall articulation. She’s able to take fuller advantage of her hip articulation as opposed to Rikku, especially since her red belt can be pushed up. The midsection cut is hidden pretty well at the belt above her navel. I don’t know why she has a neck cut instead of a ball-joint, but I can guess the sculptors thought it would look better with her choker. Yuna has the most points at 20: she has a limited ball-joint head, ball-joint shoulders, bicep cuts, elbow swivels, wrist cuts, a waist cut, angled hip cuts, upper thigh cuts, swivel knees, swivel ankles, and limited cuts on her feet. With the addition of a torso cut, she’s basically the same as Rikku from the waist up. Instead of ball-joint hip articulation, Yuna has diagonal cut hips and cuts where her thighs meet her booty-shorts. The hips cuts blend in so damn well that I only discovered them by accident, and almost wrote her up with 18 points! It’s another aesthetic choice on the designers’ parts. Rikku’s hip joints are covered, so they don’t stand out as looking weird. Yuna’s can be seen because of her dress design, so they were made differently. Her feet are interesting to say the least. Instead of the limited ball-joints the other two have, Yuna has a pair of limited joints. The cuts in her feet allow her stance to shift left and right. This is a pretty cool feature, but it would be served better by a figure with unimpeded ball joints at the hips. Even with four extra joints, she and Paine rate about equal. There are a few action poses you can put this bunch into –especially with the help of the stands—but they’re definitely not meant for playing. Each lady comes with a three-part clear plastic stand, and two sets of hands –one set neutral, one set holding weapons. Yuna’s second pair of hands are sculpted holding her pair of big-assed guns. The guns themselves look pretty good, but seem to be a tad too large. There’re also a few spots of minor bleeding in between the fingers and pistol grips. Rikku’s second set is holding her daggers. They look pretty damn cool if you ask me. I really think the circular hand guards were pulled off quite nicely. The red paint highlights down the center of the blade are quite striking. 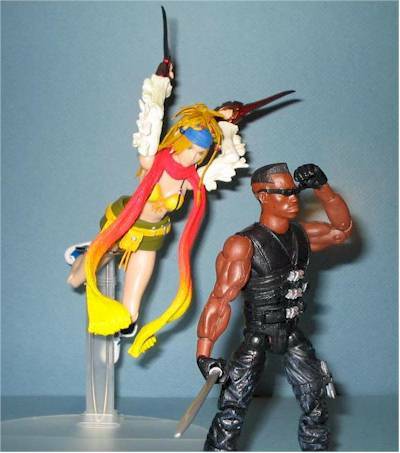 However, because of the overall design, Rikku has next to no wrist articulation when these are plugged in. Paine’s second set of hands are slightly different. One is spread open, while the other holds her weapon. 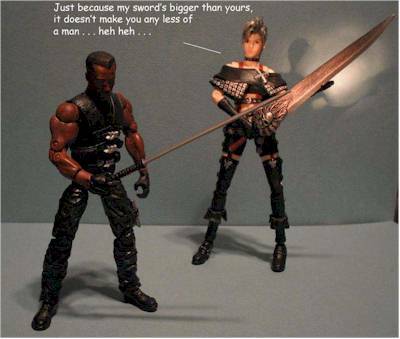 Paine’s sword is the clear winner in this section. The hilt design alone with the skull on both sides is simply awesome. The stands are really nice, and are designed along the same lines as most sixth-scale stands. With a little balancing, each figure can stand on her own, but they do have a tendency to make the occasional leap from the shelf, so the stands are still needed. I would have preferred the weapons sculpted separately, but at least these work out well enough that I’m going to complain too much. Except for their separately sculpted clothing, these two are pretty decent. I wouldn’t go throwing them across a room though. With Rikku, I’m counting the days until her hair snaps of and requires a glue job. That’s for the average asking price of $20! I’ve seen them higher at $25 as well, and that’s just ridiculous! However, several stores have dropped their prices down to the $15 range, which would be closer to a two and a half star rating. When I can pick up Toy Biz figures for less than $7, or McFarlane for around $10, the money doesn’t sit well with me, especially without loose weapons. However, if you look hard enough there are one or two deals to be had out there. I got all three of mine at Tower Records for $12.99 apiece. You’re not going to find these any cheaper. (Plus, if you spend a total of $20 or more, Tower ships your stuff for free!) At that price I think their worth a bump up to three stars, but it always depends on the individual collector. Yes Anime is a little spendy at $19.95 a pop. You can also order them as a set for $49.95 ($16.65 apiece). 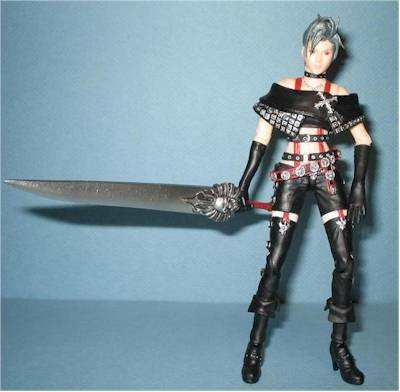 They also have a selection of previous Final Fantasy figures at various prices. Toy Fever has the set for $39.95 ($13.35 apiece). Explosion Toys has them for $14.95 each. Despite their flaws, I have to say that these are some of the best looking figures I’ve picked up in a long time, and they look absolutely awesome on display. They aren’t the most flexible female figures out there, but they’re certainly some of the best rendered. The sculpting and excellent paintwork really set the look of this bunch above most Anime-themed figures out there. The articulation isn’t perfect, but that’s not the reason people would buy these figures in the first place. There’s certainly more than enough present to work with pose-wise. While I still prefer loose weapons, the ones sculpted into the alternative hands still look great and work nicely. 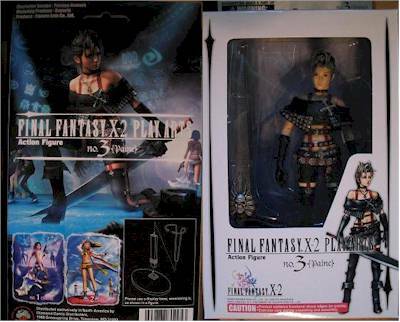 Yuna is probably the biggest draw out of these three, being the main character from FFX and FFX-2. She’s certainly a stunning figure –and that dress just leaps out at you from the shelf. I’ve always had a thing for the “bad-girl” look, and Paine really captures it. I’m having flashbacks to the audiences from all those Rocky Horror shows I’ve seen . . . Rikku takes a little bit of a hit here because of her glazed expression and fragile hair, but leave her alone and she’ll still display well. These figures are generally hard to find outside of Japan at decent prices, and that might be a drawback for some collectors. However if you’re a big fan of the Final Fantasy series, or just an Anime fan like me, these are definitely worth picking up –especially at a $12.99 price tag.